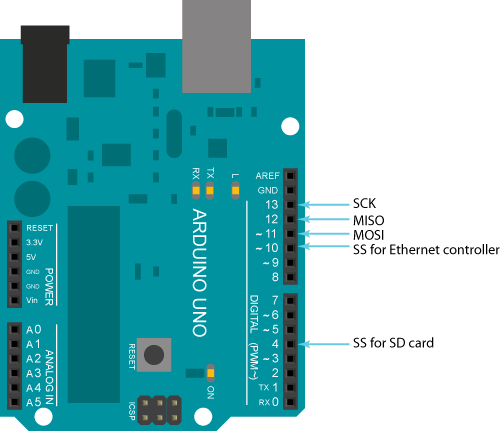 This library is designed to work with the Arduino Ethernet Shield, Arduino Ethernet Shield 2, Leonardo Ethernet, and any other W5100/W5200/W5500-based devices. The library allows an Arduino board to connect to the Internet. The board can serve as either a server accepting incoming connections or a client making outgoing ones. The library supports up to eight (W5100 and boards with <= 2 kB SRAM are limited to four) concurrent connections (incoming, outgoing, or a combination). The Ethernet class initializes the ethernet library and network settings. The IPAddress class works with local and remote IP addressing. The Server class creates servers which can send data to and receive data from connected clients (programs running on other computers or devices). The client class creates clients that can connect to servers and send and receive data. The EthernetUDP class enables UDP message to be sent and received.